I have a new venture. It's on a site called Fine Art America. A great place where a person can buy prints of photo's or paintings, sculptures..anything really. The prints of paintings are on postcards or stretched canvas, or mounted in a frame and are really reasonably priced. Of course the larger the item the more expensive.. AND the higher the quality of the original the more one would expect to pay. I've submitted a variety of items, some of my original paintings and some of my original photographs taken during my travels. I'm still searching through my photograph collection for more, so keep an eye out on the site, you never know if there might be something that pops up that is perfect for a gift just for you! 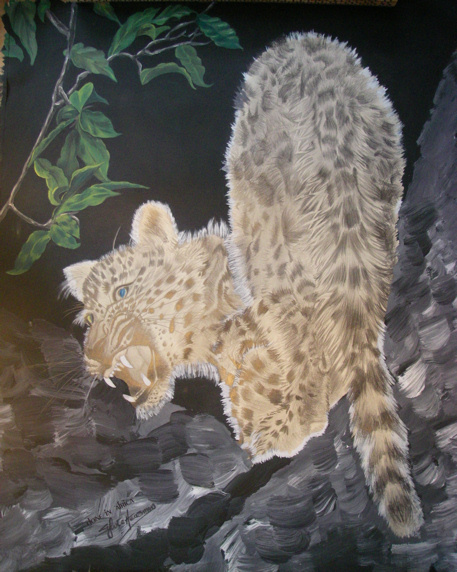 Also on the site, Leopard at night.